The purpose of this page is to remember the lives of Polish-American men from Orleans County who made the ultimate sacrifice during the Second World War. Many Orleans County residents gave their lives in defense of freedom in Europe and Japan and they shall never be forgotten. Bataan - Jan. 1942 - Sgt. 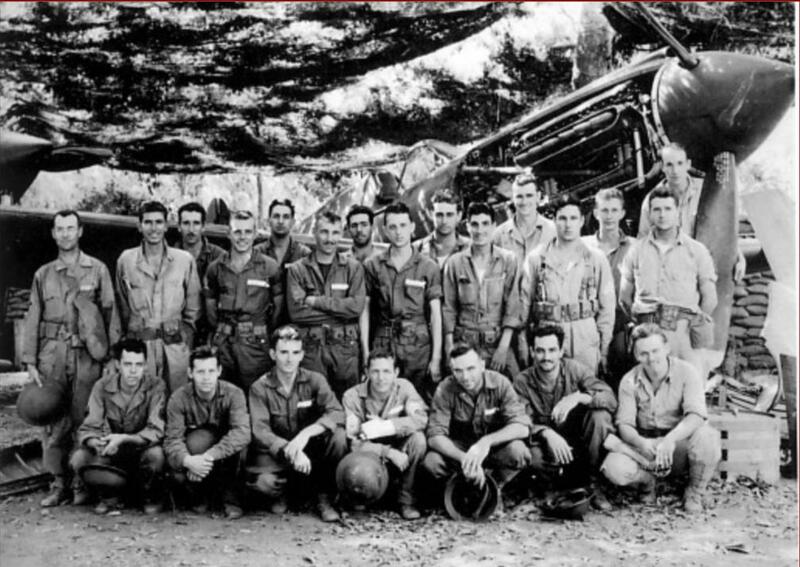 Dujenski, standing far right, in front of plane prop. John Dujenski enlisted with the U.S. Army on August 4, 1939 and was placed with the 28th Bombardment Squadron. Not much is known about Sgt. Dujenski, but he was present in the Philippines as early as 1941. At the time of the Battle of the Philippines, Dujenski was attached to the HQ Squadron of the 24th Pursuit Squad. At the Battle of Bataan, V Interceptor Command threw the 28th and 24th into ground service as infantry. Both squads were completely wiped out and the survivors, including Sgt. Dujenski, were taken prisoner by the Japanese Army. Those survivors were subjected to the famed Bataan Death March and the survivors of the march were subjected to harsh treatment at the hands of their Japanese captors for the remainder of the war. Sgt. Dujenski died on August 15, 1942, the exact reason for his death is unknown. His body was never returned home, his body is interred as an Unknown at the American Cemetery in Manila, Phillipines. The son of Stanley Furmanski, Pfc. Arthur Furmanski enlisted with the U.S. Army on September 26, 1942 at Rochester, NY. He was placed with the 15th Cavalry Recon. Squadron which was trained in California before being sent to Scotland in May of 1944. On July 5th, the 15th came ashore at Utah Beach and pushed into France under the command of Gen. George Patton. The 15th's first major engagement was at the Falaise Pocket, where Pfc. Furmanski was killed in action on the second-to-last day of the engagement. His body was never returned home, he is interred at the Brittany Cemetery in Normandy, France. Pfc. Majeski enlisted in the U.S. Army as part of the New York National Guard, 108th Regiment, Company F organized out of the Medina Armory. He enlisted with the Philippine division where he was stationed throughout the war. While serving, he was wounded at the Battle of Luzon on February 7, 1945 to which he wrote home stating to his family that he had accounted for at least six dead Japanese soldiers before he was wounded. Upon his return he was transfered to Company K. April 9, 1945, all three companies of 40th Division pushed towards the inland of the rugged Negros Islands as part of Operation VICTOR I, as part of the larger effort to liberate the Philippean Islands. The men were met by stubbord Japanese opposition, heavily booby-trapped terrain, and heavy defended positions. On Friday, April 13, 1945, Pfc. Majeski was killed during those ground operations. His body was never returned home; he is interred at Ft. McKinley, Manila, Philippean Islands. He was awarded the Purple Heart and Silver Star. The son of John and Stella Romanowski Nayman, Pvt. Nayman enlisted in the U.S. Army on March 28, 1944 at Ft. Dix, New Jersey. Nayman was placed with the 12th Infantry Regiment, 4th Division which had been stationed in England since January of 1944. On June 6, 1944, 12th Infantry was selected to spearhead the assault on Utah Beach for the D-Day invasion. Famed author J.D. Salinger was also a member of 12th Infantry. The men at Utah Beach were met with little resistance in comparison to other landing zones and the 12th pushed further into France in the coming months, taking part in the capture of Cherbourg and engaging the Germans at the Falaise Pocket. As the U.S. Army continued to push into Germany, soldiers met fierce opposition in the Hurtgen Forest which was being utilized as a staging area for the future efforts that would take place during the Battle of the Bulge. The 28th Divison was sent along the Kall Trail, supported by M29 Weasel armored transport vehicles. The conditions of the road slowed progress and the 28th was hit head on by German forces which were ready and prepared for the assault. On November 6, Pvt. Nayman and the 12th Infantry were broke off from 4th Division and sent to reinforce 28th Division. By mid-November, the entire 28th Division had been destroyed but was quickly replaced by 4th Division. Between November 7th and December 3rd, 4th Division had lost over 7,000 men, averaging about 10 men per company per day. Pvt. Nayman would have been one of the last casualties, having been killed on December 3, 1944 just prior to the removal of 4th Division from the Hurtgen Forest. Had Pvt. Nayman not been killed that day, he would have been spit back into the heat of battle, as the division was sent to engage the Germans at the Battle of the Bulge approximately two weeks later. Pvt. 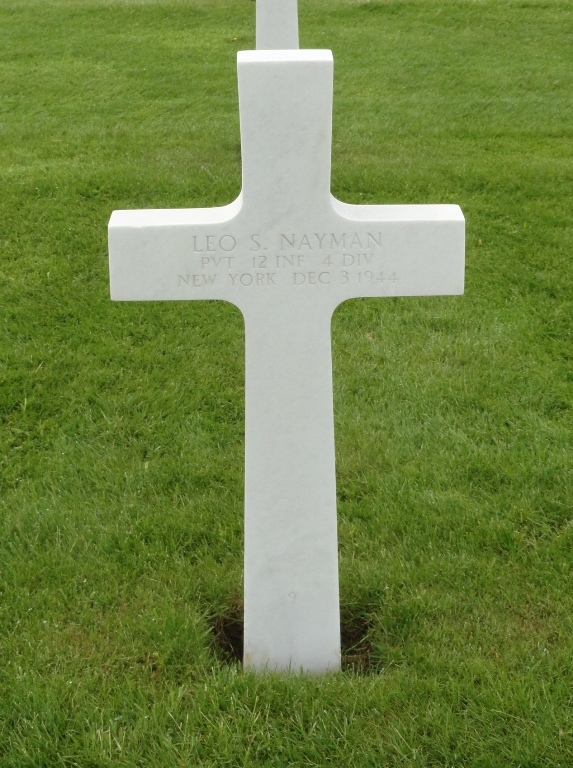 Nayman never returned home, he was interred at the Henri-Chapelle Cemetery in Liege, Belgium. The son of Nicholas Ostrowski, Julius Ostrowski enlisted with the U.S. Navy in December of 1941 (unconfirmed). Ostrowski was placed with the U.S. Naval Reserves and was stationed in New Jersey through 1942. After the completion of Naval Air Station (NAS) Houma in Louisiana, Ostrowski was transferred to the Gulf of Mexico at NAS Houma (after May of 1943). The extent of his service is unknown, but NAS Houma was constructed as a docking station of Lighter-than-air (LTA) airships. These airships were utilized to patrol the U.S. coast and it is apparent that Ostrowski was a crewman aboard the airships. On the evening of April 19, 1944, U.S. Navy Airship K-133 of Airship Patrol Squadron 22 (ZP-22) was caught in a thunderstorm while patrolling over the Gulf of Mexico. The airship went down, killing twelve of thirteen crewmen, one of them being BM2 Ostrowski. There is no record to indicate if his body was recovered and if so, where it was interred. Cpl. Stanley R. Rice, Jr. Son of Stanley & Pelagia Rice. Cpl. Rice was KIA on the first day of the Battle of Okinawa. His exact service that day is unknown as he's listed as Assistant Cook on Marine Corps Honor Rolls. On February 6, 1945, Pvt. Stawicki and men of his company were told to set out for Cadenbronn and to attack the small town of [Lexing]. The men were told that Lexing was held by a small group of Germans, mostly Poles, numbering approximately 25; they were ready to surrender. One man recalled that the assignment was "...another death trap," as the intelligence they received had been incorrect. Despite orders from command, the company commander ordered the group to withdraw from the town, saving many U.S. soldiers. Many men were wounded, nearly 23 were reported missing with most of them being reported as "KIA" in the coming days. Pvt. 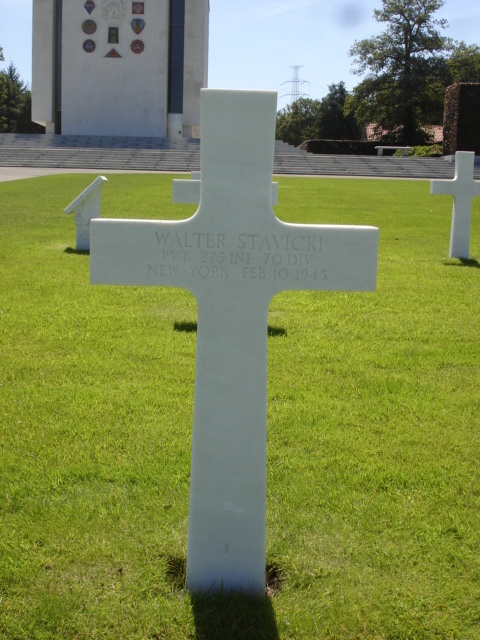 Stawicki was one of those men. His obituary states that he died from wounds received on February 10, 1945. He never returned home, his body interred at the Neuville-En-Condroz Cemetery in Belgium. He received the Bronze Star Medal and Purple Heart. 1st Sgt. 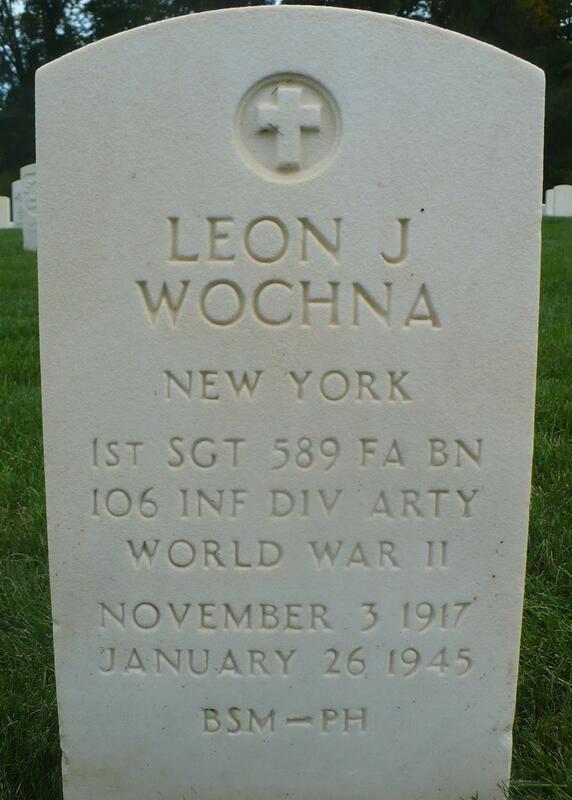 Wochna was a member of the 589th Field Artillery Battalion and was present at the Battle of the Bulge, starting in December of 1944. 1st Sgt. Wochna was present for the 589th's famed "Alamo Defense" against a Panzer Division for nearly three days. Outmanned and outgunned, the 589th held their position with fewer than 400 men and three 105mm Howitzers. In the final day of the engagement, the 589th was nearly destroyed with less than 50 men escaping back into friendly territory. Due to Wochna's fate, we know that many men were taken prisoner after the engagement. 1st Sgt. Wochna's military records state that he was "executed...shot while attempting escape" although the record also says that he "...died in ship's sinking or result of ship sinking..." The exact circumstances behind his death are unknown and the exact place of incarceration after the Bulge is uncertain, however there is a high chance that he was kept at Stalag 3A with other members of the 106th Infantry. He went missing on December 24, 1944 and was killed on January 26, 1945. His body was finally brought home on March 22, 1955 and his body interred at Woodlawn Cemetery in Elmira, New York. He was awarded the Purple Heart and Bronze Star Medal. Pvt. Zyglarski was killed during the Tunisia Campagin on April 3, 1943. His body was never returned home, he is interred in the North Africa American Cemetery in Carthage, Tunisia.